This blog is a record of the email broadcasts and other communications issued by Lily Wang (ASA President 2018-2019) covering Acoustical Society topics. If you wish to submit comments or suggestions related to these or any ASA topic, please send them to Lily Wang’s attention at [email protected]. The deadlines for preregistration and making hotel reservations at ASA rates for the spring 2019 meeting in Louisville, 13-17 May, are rapidly approaching. If you are planning to attend the meeting, please act now to avoid missing these deadlines. The Itinerary Planner is available for information about the schedule of sessions and other events. As I mentioned in an earlier email, this meeting marks the 90th anniversary of Acoustical Society of America meetings; join us in Louisville to celebrate the special occasion! If you’re not sure what to expect at an ASA meeting, please check out this video on the ASA YouTube page. We also remind you that current ASA members are entitled to download 5 free American National Standards. Visit the ASA Standards webpage where you will find the Tutorial containing instructions about how to download free standards. You will also find many other resources there about the ASA Standards Program, including an informative video, a recent JASA article on “A History of ASA Standards”, a database of acoustical and bioacoustical terminology, and information about how to become involved in national and international standards development. Are you interested in upgrading to become a Full Member of the Acoustical Society of America? (An Associate Member actually pays the same dues amount as a Full Member after 5 years of membership, but does not enjoy all of the benefits of full membership such as the right to vote and hold office.) Perhaps you haven’t done so because you may have found the paper-based process cumbersome in the past. I am pleased to announce that the ASA has instituted new and simpler processes through which you can apply to become a Full Member of the Society. 1. During the annual membership renewal process, the online renewal site now includes instructions on how to apply for full membership at the time of renewal. 2. If you’ve already paid dues for the current year but would still like to apply now to become a Full Member, we have also created an electronic PDF-fillable form that you can download from the ASA webpage. Simply download the form and submit it along with your CV to [email protected], and your application will be reviewed immediately after submission by the Membership Committee. I hope that you will take a few minutes to upgrade to full membership. Thank you for being a member of the Acoustical Society of America! The ASA leadership team is eager to improve your membership experience. If you have other ideas, please feel free to share those with me or any current Executive Council or Technical Council member. The technical program for the upcoming meeting in Louisville includes 102 sessions with over 998 abstracts scheduled for presentation during the meeting. The Itinerary Planner is now available which contains the technical sessions, other events, and committee meetings. There are also several additional activities and events taking place at the meeting. I particularly encourage you to attend the Tutorial Lecture on ‘Acoustic Propagation in Forests’, the Short Course on ‘Electronic Speckle Pattern Interferometry’, and the Society Luncheon featuring a lecture on ‘Music, Machines, and Meaning’. Additional information on these events and others are described below and on the Louisville meeting webpage. The first ASA meeting convened in May 1929, so Louisville will mark the 90th Anniversary of ASA meetings! I hope that many of you will be able to attend this meeting in Louisville and join me in celebrating the special occasion. ASA meetings provide outstanding opportunities to learn from and network with others who share your interests in acoustics, and to enjoy the company of your friends and colleagues–both old and new–at the planned social events; I hope to see you there! Hotel reservations at special ASA discounted rates can be made at The Galt House hotel online reservations site. Please make your reservation early; the deadline is 11 April 2019 at 11:59 p.m. EDT. Preregistration fees and details can be found on the line registration site. The deadline for preregistration is 8 April 2019. The Itinerary Planner containing the meeting schedule and abstracts is now available to create your personal schedule for the meeting. Other meeting events include open meetings of the an Ultrasound Modeling Workshop, ASA Technical Committees, Student Design Competition, the Gallery of Acoustics, an Early Career Publishing Workshop, and a Women in Acoustics Roundtable Discussion Session. The Tutorial Lecture on Acoustic Propagation in Forests will be presented Michelle Swearingen, U.S. Army Engineer Research and Development Center/Construction Engineering Research Lab, will be held on Monday, 13 May, at 7:00 p.m. This tutorial explores the myriad of computational methods that have been developed to describe acoustic propagation in forested environments. The Short Course on Electronic Speckle Pattern Interferometry will be taught by Thomas Moore, professor of physics at Rollins College, on 12 and 13 May. This short course will introduce the participants to the theory and practice of electronic speckle pattern interferometry, with an emphasis on design and construction of an inexpensive table-top system for laboratory use. These two events require separate registrations as described on themeeting website. See the meeting website for details and to preregister for events and purchase tickets. The Student Activities section describes the details about events for students including Students Meet Members for Lunch, New Students Orientation, Meet and Greet, and the Students’ Reception. The deadline for Funding opportunities including the Young Investigator Grants, Dependent Care Subsidies, and Early Career Travel Subsidies is 1 April. The deadline for applying for Student Transportation Subsidies is 8 April. Each fall, a nominating committee is charged with preparing a slate of candidates for the election to be held in the spring, approximately 18 months after the committee is appointed, chaired typically by the past president. In an effort to be more transparent about the nomination process, a ‘call for nominations’ has been put out this year to assist the committee with its work. Please see the committee’s message below for more details on how to submit nominations. Thank you for your engagement in this process! The ASA has convened a nominating committee to prepare a slate for the ASA election in 2020. We, the chair and members of that committee, are requesting your assistance in developing the list of nominees. Nominees must be full members or fellows of the society and must be willing to serve for three years on the Executive Council. Nominees should be able to attend all ASA meetings. Executive Council members will serve on one of the four administrative councils (Outreach, Member Engagement and Diversity, Publications and Standards, Financial Affairs) during their term on Executive Council. Furthermore, they can be selected to serve on the Audit Committee or the Student Council advisor. We are seeking nominees who are engaged in and excited about the ASA. We are hoping to fill our Executive Council with energetic, forward-thinking people with a love of acoustics and enthusiasm for the Society’s mission. In addition to the nomination of others, self-nominations are welcome particularly from individuals who are active participants in the Society and have not been nominated in the past. Please send names and contact information for potential nominees to [email protected] no later than 22 March 2019. A short statement detailing the nominee’s qualifications and why this person would make an excellent ASA executive council member must be included for full consideration. Lastly, please let us know if you have any questions or suggestions. Happy 2019! The Acoustical Society of America (ASA) is seeking nominations for its 2019 Science Communication Awards in Acoustics, which are intended to recognize excellence in the presentation of acoustics related topics to a popular audience. Awards are available for acoustics professionals and journalists. Entries may be newspaper or magazine articles, TV or radio broadcasts, books, or websites that were published, broadcast, printed, or posted between 1 January 2017 and 31 December 2018. Separate awards will be made to a journalist and a professional in the field of acoustics. Submissions may be made by the author or another party. An independent panel will judge entries according to their general accessibility, relevance to acoustics, accuracy, and quality. Each award includes a $2,500 cash prize and a $1000 stipend to travel to the ASA meeting in San Diego, CA, 2-6 December 2019, where the awards will be presented on Wednesday afternoon, 4 December. The deadline for submission of entries is 15 March 2019. Please visit the Call for Entries for additional information and to submit an entry. The calls for nominations and applications are still open for a number of other ASA prizes and scholarship, with upcoming deadlines this spring. Please consider nominating or encouraging deserving persons to apply! The Leo and Gabriella Beranek Scholarship in Architectural Acoustics and Noise Control. (Application deadline: 28 February 2019) This scholarship was established to support graduate study in the fields of architectural acoustics and noise control. Rossing Prize in Acoustics Education. (Application deadline: 1 April 2019) The Rossing Prize in Acoustics Education was established to recognize an individual who has made significant contributions toward furthering acoustics education through distinguished teaching, creation of educational materials, textbook writing and other activities. Raymond H. Stetson Scholarship in Phonetics and Speech Science. (Application deadline: 1 April 2019) This scholarship is for graduate study and research in scientific areas related to the field of phonetics and speech production as described in the application form. The Frank and Virginia Winker Memorial Scholarship for Graduate Study in Acoustics. (Application deadline: 1 April 2019) The Frank and Virginia Winker Memorial Scholarship for Graduate Study in Acoustics has been established to support graduate study in the fields of architectural acoustics, noise control, or engineering acoustics. As the 2018 calendar year comes to a close, we’d like to inform you of a number of upcoming deadlines and resources for you as an ASA member. More details on each of these items follow this message below. ASA Member Benefits: Download your annual 5 free standards before 12/31/18! I hope you will also consider volunteering on an ASA administrative or technical committee. Learn more and complete a form with your interests before the end of the year at this website. New committee member recommendations are typically submitted in January and then approved at the spring ASA meeting, for terms beginning 1 June. Applications for ASA scholarships, fellowships, and prizes are now available online. You are encouraged to apply yourself or to nominate or encourage others to apply as appropriate. Funding for the following scholarships and prize is provided by the Acoustical Society Foundation Fund. This scholarship is for graduate study and research in scientific areas related to the field of phonetics and speech production as described in the application form. This scholarship was established to support graduate study in the fields of architectural acoustics and noise control. The Frank and Virginia Winker Memorial Scholarship for Graduate Study in Acoustics has been established to support graduate study in the fields of architectural acoustics, noise control, or engineering acoustics. The Rossing Prize in Acoustics Education was established to recognize an individual who has made significant contributions toward furthering acoustics education through distinguished teaching, creation of educational materials, textbook writing and other activities. The German Acoustical Society (DEGA) is pleased to invite you to the 23rd International Congress on Acoustics – ICA 2019 – in the beautiful and historical city of Aachen. The ICA 2019 takes place from 9 to 13 September 2019. It will also include the 4th EAA Euroregio conference. Registration and submission of abstracts is now officially open. You are welcome to join the global community of acousticians at ICA and submit your abstract until 1 February. We are looking forward to seeing you in Aachen next summer. ASA members are eligible to receive five free American National Standards per year, in PDF format, with the exception of Nationally Adopted International Standards (NAIS), which are available for $35 plus tax (plus the use of one of your “five free standards”) . Visit the ASA Standards Store to take advantage of this valuable benefit. See the Standards Tutorial for further information. Check this site for open positions in acoustics. If your company or organization has a position to fill, the ASA webpage is an excellent place to advertise. There is no charge to post ads for Internships, Undergraduate, Graduate, Post-Doc and Entry Level Positions. Entry Level Positions are those that are designed for recent graduates and/or do not require prior work experience, or require limited prior experience of 5 years of less. The cost for all other job postings is $200 for each job title. All terms from Standards S1.1 American National Standard Acoustical Terminology and S3.20 American National Standard Bioacoustical Terminology have been incorporated into a searchable terminology definition database. Key acoustical definitions are now at your fingertips. You can also support ASA throughout the year by selecting the Acoustical Society of America as your charity of choice when making purchases from Amazon Smile (https://smile.amazon.com/ ). One last reminder… have you completed the recent survey on ASA demographic diversity? It only takes one minute to complete! Click here to complete the survey which will remain open until 30 November. Thank you for your support of these ASA initiatives. As you may know, the ASA has been piloting a program over the past 3 years to broadcast in real time the presentations from certain sessions at ASA meetings, as well as to record some for later dissemination. For the upcoming joint 176th Meeting of the ASA and 2018 Acoustics Week in Canada of the Canadian Acoustical Association, we are changing the model, based on our experiences with the pilot program. ASA has contracted with The Conference Exchange to assist with presentation management at the Victoria meeting. Their Confex Podium system will be used to manage all lecture presentations being given at the ASA conference. Below are some additional details about the presentation management system we’ll be using in Victoria. How do authors upload their presentation? If authors plan to use the Windows computer that ASA will provide in the meeting room, they may upload or update their presentation in three ways: 1) Through 1 November 2018 – via an online Speaker Center, accessible from a personalized link sent to the presenting author from ‘[email protected]’ 2) On-site in the ‘A/V Preview’ room, up until 5:00 PM the day before they are scheduled to speak 3) In the meeting room, prior to the start of their presentation (preferably before the session begins) They may upload files as large as 100 MB in advance of the meeting. Larger files should be uploaded onsite. The computers provided by ASA will support Powerpoint, PDF, HTML. audio (mp3, wav, wma) and video (mp4, wmv, mov) files. In Victoria, we will no longer be identifying only a few sessions for live broadcast + recording. Instead, authors of all lecture presentations will be asked if they consent to having their presentation (audio + slides) recorded for later dissemination by ASA; no live broadcasting will occur. There will also be no option of having the recording viewable for only 2 weeks after the meeting. If authors elect to have their presentation recorded, ASA expects that the recording may be shared indefinitely. The recording process is managed through the Confex Podium system. Authors indicate whether or not they agree to having their presentation recorded at the time that they upload (or update) their presentations. All registered meeting attendees will receive complimentary access to view recorded talks, when they become available shortly after the meeting. Non-attendees will be charged a fee to be able to access the recordings. The current plan is that after a year, those recordings may be migrated to the ASA YouTube channel so that they may be freely accessed by all. What if an author plans to use their own laptop / Mac? No problem! There will be switch boxes in every meeting room, so authors can present from their own computer. If they wish to have their presentation recorded, they may also follow the instructions in the email sent from Confex to give ASA permission to record their talk. If permission is granted, we will record the audio from the presentation. The authors may upload a PDF copy of their slides to accompany that audio recording. I am excited that the ASA is pursuing this new way of disseminating meeting content to our attendees and others who are not able to attend in person. If you have any questions about this process, please do not hesitate to contact me. This is a reminder that the deadline for Victoria meeting pregistration at discounted rates is Monday, 8 October, and the deadline for making hotel reservations at the special ASA rate is Wednesday, 10 October. Details about reservations and meeting events are included below and online at the Victoria meeting webpage. Information about the Mobile App and the plans for recording sessions will be sent in a follow up message. ASA has released a video about ASA meetings, highlighting the many activities and benefits of attending! Watch it now. We plan to upload more video content soon to the ASA YouTube channel. If you haven’t already, I encourage you to subscribe to the channel by clicking the bell in the upper right of the site, so that you are notified as new videos are posted. The Technical Program includes topics of interest covering all areas of acoustics. Among the special sessions are the Hot Topics in Acoustics session and the Undergraduate Research Poster Exposition. This meeting will include a Tutorial Lecturetitled “An Introduction to Sound in the Sea” presented by Tom Dakin of Ocean Networks Canada. A short course on Bioacoustics and Ecoacoustics presented by Gianni Pavan of the University of Pavia is offered. These two events require separate registrations as described in the meeting information. ASA is hosting a speed-networking event for early career participants at the meeting to facilitate professional relationships and collaboration between early career participants and more experienced members of the society. The first half of the event will include multiple short conversations between early career participants and more senior society members. The second half will be a social in which the participants will be given the opportunity to continue conversations with the more experienced society members as well as interact with other early career participants. The event will be held on Monday, November 5, from 5:30 p.m. to 7:00 p.m.
Open meetings of the ASA Technical Committees are scheduled for Tuesday, Wednesday, and Thursday. These are working, collegial meetings where much of the work of the ASA is accomplished by actions that originate and are taken in these meetings including proposals for special sessions, workshops, and technical initiatives. All meeting participants are cordially invited to attend these meetings and to participate actively in the discussions. Meeting social events will include the Social Hours on Tuesday and Thursday evenings, the Women in Acoustics luncheon on Wednesday afternoon, and the ASA Jam on Wednesday night. The Society Luncheon and Lecture will feature a presentation titled “If Bodies Could Talk.” by Bryan Gick, Professor and Guggenheim Fellow in the Department of Linguistics at the University of British Columbia. For attendees who will be accompanied by guests, the Accompanying Persons Programwill include speakers on Monday through Thursday who will speak about the history and culture of the city. See the meeting website for details and to register for events and purchase tickets. The Student Activities section of the Victoria meeting webpage describes the details about events for students including Students Meet Members for Lunch, Student Orientation, Meet and Greet, and the Students’ Reception. A block of guest rooms at discounted rates has been reserved for meeting participants at theFairmont Empress. Early reservations are strongly recommended. Special ASA meeting rates are not guaranteed after Friday, 10 October 2018. The online preregistration site is open and the deadline for preregistration for the meeting is 8 October. The technical program for the joint ASA/CAA meeting in Victoria includes 121 sessions with 1290 abstracts scheduled for presentation during the meeting. The Itinerary Planner is available which contains the technical sessions, other events, and committee meetings. There are also several additional activities and events taking place at the meeting. I particularly encourage you to attend the Tutorial Lecture on ‘An Introduction to Sound in the Sea’, the Short Course on ‘Bioacoustics and Ecoacoustics’, and the Society Luncheon featuring a lecture on ‘If Bodies Could Talk’. Additional information on these events and others are described below and on the Victoria meeting webpage. The deadlines for several meeting funding opportunities is tomorrow, Friday, 7 September. The preregistration and hotel reservation deadlines are less than a month away. Details are included below and online at the Victoria meeting webpage. I hope that many of you will be able to attend this meeting in beautiful Victoria. ASA meetings provide outstanding opportunities to learn from and network with others who share your interests in acoustics, and to enjoy the company of your friends and colleagues–both old and new–at the planned social events; please join us! This meeting will include a Tutorial Lecture titled “An Introduction to Sound in the Sea”presented by Tom Dakin of Ocean Networks Canada. A short course on Bioacoustics and Ecoacoustics presented by Gianni Pavan of the University of Pavia is offered. These two events require separate registrations as described in the meeting information. For attendees who will be accompanied by guests, the Accompanying Persons Program will include speakers on Monday through Thursday who will speak about the history and culture of the city. 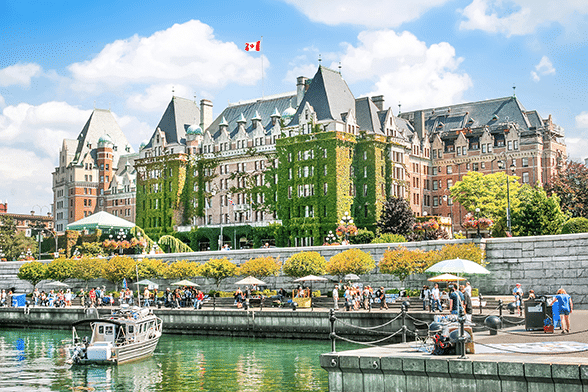 Blocks of guest rooms at discounted rates have been reserved for meeting participants at the Fairmont Empress and the Victoria Marriott Inner Harbour Hotel. Early reservations are strongly recommended. Special ASA meeting rates are not guaranteed after Friday, 10 October 2018. This is a reminder that the upcoming deadlines for ASA Fellowships, Prizes, and Awards that are now available. Please consider applying for these yourself, and nominate or encourage your students, junior colleagues, and others to apply, as appropriate. Links to application or nomination details can be found below. These ASA awards, fellowships, scholarships and prizes are supported by the Acoustical Society Foundation Fund. Also available are ICA-ASA Young Scientist Conference Attendance Grants which are offered in connection with attendance at the 2019 International Congress on Acoustics (ICA) in Aachen, Germany (9-13 September 2019). Eligibility requirements and submission instructions appear below. As many of you know, the ICA meets once every 3 years. The ASA is pleased to be a sponsor of these grants for young scientists to attend this conference. The application requires support from an officer of your local acoustical society; I hope to hear from many of you, when you wish to request support for your applications! Robert W. Young Award for Undergraduate Student Research in Acoustics – Application deadline: 10 September 2018 A gift to the Acoustical Society Foundation Fund made by the family of the late Robert W. Young in his honor has been established to grant undergraduate student research awards. The F. V. Hunt Postdoctoral Research Fellowship was established by the Society to carry out Professor Hunt’s wish that his estate be used to further the science of, and education in acoustics. Fellows receive a stipend, provided jointly by the Hunt estate and a fund established by the Acoustical Society, to support their research on a topic in acoustics at an institution of their choice. The William and Christine Hartmann Prize in Auditory Neuroscience – Application deadline: 24 September 2018 The William and Christine Hartmann Prize in Auditory Neuroscience was established in 2011 through a generous donation by Bill and Chris Hartmann to the Acoustical Society of America Foundation Fund to recognize and honor research that links auditory physiology with auditory perception or behavior in humans or other animals. Medwin Prize in Acoustical Oceanography – Application deadline: 24 September 2018 The Medwin Prize in Acoustical Oceanography was established in 2000 from a grant made to the Acoustical Society Foundation Fund by Herman and Eileen Medwin to recognize a person for the effective use of sound in the discovery and understanding of physical and biological parameters and processes in the sea. ICA-ASA Young Scientist Attendance Grants – Application deadline: 1 February 2019 http://icacommission.org/YSgrants.html The International Commission for Acoustics (ICA), with the support of the ASA, has established the ICA-ASA Young Scientist Conference Attendance Grants (YS Grants) Programme to help young acousticians attend International Congresses on Acoustics. For ICA 2019, the host organization DEGA is contributing additional funding. Each grant is currently up to 500 EUR from which a portion will be used to cover the conference registration and the remainder provided at the time of the conference. Candidates must be under 35 years on the day of the opening ceremony of the Congress and may be either undergraduate or postgraduate students, postdoctoral or young acousticians. Special attention will be given to applicants from developing countries. The deadline for applications for a ICA/ASA/DEGA YS Grant is 1 February 2019. There are a number of meeting highlights as described below. Registration is now open! Many of the ticketed events sell out early, so please register soon.I hope that you will be able to attend the meeting. Hotel Reservations at special ASA discounted rates can be made at the Fairmont Empress or the Victoria Marriott Inner Harbour Hotel. Please make your reservation early; the deadline for the Fairmont is 10 October 2018 at 11:59 p.m. PST. The deadline for the Marriott is 10 October 2018 at 5:00 p.m. PST. Other meeting technical events include the Hot Topics session, open meetings of the ASA Technical Committees, Undergraduate Research Exposition, and an Early Career Speed-Networking event. The Tutorial Lecture on An Introduction to Sound in the Sea will be presented by Tom Dakin, Ocean Networks Canada on Monday, 5 November, in Session 1eID, at 7:00 p.m. in Salon A. The tutorial will address why underwater acoustics are important, it’s uses, how sound propagates so far in the ocean, man-made sounds, including shipping noise, and the impact of noise in the oceans. The Short Course on Bioacoustics and Ecoacoustics will be taught by Gianni Pavan, a Researcher from the University of Pavia, Italy. The short course will be held on Sunday and Monday, 4 and 5 November. Bioacoustics and Ecoacoustics are rapidly developing disciplines to study and monitor ecosystems by their soundscape composition. The 2018 Undergraduate Research Exposition, a poster session sponsored by Education in Acoustics, will be held in session 3pEDa on Wednesday, 7 November, in Prefunction 1B at the Victoria Conference Centre. This session provides a forum for undergraduate students to present their research in any area of acoustics. It is intended to inspire and foster growth of undergraduate research throughout the Society, to encourage undergraduates to express their knowledge and interest in acoustics, and to foster their participation in the Society. Participant requirements: The speed-networking event is intended for early career acousticians from any subfield of acoustics, who received their last degree within the past ten years. It is not intended for students or those in the process of receiving a degree. Students are encouraged to attend the activities specifically designed for them throughout the week. Please contact Tessa Bent ([email protected]) or Dom Bouavichith ([email protected]) if you have any questions. Social events will include Social Hours on Tuesday and Thursday evenings, the Women in Acoustics luncheon on Wednesday afternoon, the ASA Jam on Wednesday night, and the Society Luncheon and Lecture on Thursday. Deadlines for the Young Investigator Grants, Dependent Care Subsidies, and Early Career Travel Subsidies is 7 September. The deadline for requesting Student Transportation Subsidies is 8 October. The policy was developed after reviewing current best practices and similar policies that other professional societies have adopted. It states clearly ASA’s commitment that “all participants in Society activities will enjoy an environment free from all forms of discrimination, harassment, and retaliation.” Details on how incidents of harassment at an ASA activity can be reported by any person and the process that ensues may be found in the policy. Please take a moment to review this policy now. Registrants for upcoming ASA meetings and activities will be asked to mark that they have reviewed and understand the contents of this policy. If you have any questions about the policy, please do not hesitate to reach out to me or other members of the ASA Executive Council. ASA is fortunate to have a vibrant community of volunteers, willing to serve on the Society’s technical and administrative committees. The 2018-19 Committee Booklet is now available online. Many thanks to all of you whose names are listed. Are you interested in getting more involved with ASA activities? A listing of the Society’s committees and their scopes may be found on a new page at the ASA’s website. If you wish to become more engaged with ASA and volunteer for some of these committees, please complete the form found on that webpage. ASA committees are appointed each year at spring meetings of the Society. Your interest in serving on committees will be sent to the appropriate committee chairs for their consideration when nominating members for appointment. Did you know … most committees conduct a great deal of their business at ASA meetings. Committee meetings are generally open to all (with a few exceptions: Audit, Medals and Awards, Membership, and Prizes and Special Fellowships). If you’re interested in getting involved with certain committees, please consider attending that group’s discussion at an upcoming ASA meeting! Recordings of certain talks are now available for delayed viewing through 4 July 2018, if successfully captured and agreed upon by the authors. Please visit the ASA streaming webpage to see the lists of available talks and their start times on each video. To access the recordings, please click on the recording web links provided for each session. ASA is offering this service specifically for members who were unable to attend the sessions in person, thereby broadening access to meeting content. During this piloting phase, there is no cost to ASA members. Please note that photography, audio, and video recordings of content from ASA sessions are strictly prohibited, whether in person or over the internet. I particularly want to thank the members of the live stream subcommittee who have worked with me in moving this initiative forward: Ken Bader, Anna Diedesch, Judy Dubno, Josh Gladden, Andrew Morrison, Himanshu Shekhar, and Anand Swaminathan. Many thanks also to Anna Catton and Kieren Smith for coordinating the effort onsite at the last two meetings. We anticipate that remote access of meeting content will continue but in a different manner, starting with the next meeting in Victoria, based on what we’ve learned over the past three years. More information will be provided in the near future. The following ASA Fellowships, Prizes, and Awards are now available. Please consider applying for these yourself, and nominate or encourage your students, junior colleagues, and others to apply, as appropriate. A gift to the Acoustical Society Foundation Fund made by the family of the late Robert W. Young in his honor has been established to grant undergraduate student research awards. The F. V. Hunt Postdoctoral Research Fellowship was established by the Society to carry out Professor Hunt’s wish that his estate be used to further the science of, and education in acoustics. Fellows receive a stipend, provided jointly by the Hunt estate and a fund established by the Acoustical Society, to support their research on a topic in acoustics at an institution of their choice. The William and Christine Hartmann Prize in Auditory Neuroscience was established in 2011 through a generous donation by Bill and Chris Hartmann to the Acoustical Society of America Foundation Fund to recognize and honor research that links auditory physiology with auditory perception or behavior in humans or other animals. The Medwin Prize in Acoustical Oceanography was established in 2000 from a grant made to the Acoustical Society Foundation Fund by Herman and Eileen Medwin to recognize a person for the effective use of sound in the discovery and understanding of physical and biological parameters and processes in the sea. Did you know … the Campaign for ASA Early Career Leadership (CAECL) is currently underway, with a goal of raising $300,000 to endow a new award for early career members in the society! Please visit the CAECL webpage and consider donating to the campaign now. ASA’s Committee on International Research and Education (CIRE) was established in 2006 with the mission to enhance the role of the ASA in international research and education in acoustics, particularly in developing countries. The CIRE provides competitive grants of $1,000 USD to students enrolled in acoustics programs at universities or technical institutes in developing countries. Twenty grants are made each year. Membership in ASA is not required to be eligible to receive a grant. Since 2006 more than 350 grants have been awarded to student acousticians in developing countries. Applications are now being solicited for these CIRE grants. Eligible students are asked to submit a completed application form by email to [email protected] by 15 September 2018. Please visit the ASA International Student Grants webpage for full details and the application form. All eligible ASA members are encouraged to apply for a grant. Please also assist the ASA by sharing this information with colleagues who may be eligible or who may be in contact with potential applicants. Did you know … in addition to CIRE, the ASA has 25 other administrative committees? Learn more about each committee’s charge in the annual committee booklet. If you are interested in getting involved with any of these committees, please contact me or the committee chair. This message serves as a final reminder that tomorrow is the deadline for submission of abstracts for the fall 2018 meeting of the Acoustical Society of America/2018 Acoustics Week in Canada, to be held 5-9 November 2018 in Victoria, Canada, at the iconic Fairmont Empress Hotel. There are over 60 special sessions being organized for the upcoming meeting on a broad range of topics, from the sound of emotion to machine learning for acoustic applications. Please visit the Victoria meeting information website for details about submitting abstracts and about meeting activities. As mentioned in my last message, I am interested in exploring different approaches to connect and communicate with members, as well as the general public, about how the Acoustical Society of America is striving to achieve its mission. In that vein, I have started an online ‘ASA President’s Blog’. This site will serve as a repository for the assorted email broadcasts sent in my capacity as ASA President, but I also plan to post regularly on topics pertinent to the Society. Please stay tuned! I am excited to begin my year as President of the Acoustical Society of America (2018-2019). One of the items on which I will be focusing in the coming year is to streamline communication and transparency throughout our Society. We will continue to send members emails (such as this one) with important deadlines and notices, but we will also be exploring other ways to provide information to members – more on this later! In this first communication, I am writing to remind you that the deadline for submission of abstracts for the fall 2018 meeting of the Acoustical Society of America/2018 Acoustics Week in Canada to be held 5-9 November 2018 in Victoria, Canada, is fast approaching: Tuesday, 29 May, 2018. Please visit the Victoria meeting information website for details about submitting abstracts and about meeting activities. If you have any questions or would like to share suggestions/feedback regarding ASA throughout the coming year, please do not hesitate to contact me by email. Your feedback is important and valuable, as we all work together towards the Society’s mission: to generate, disseminate, and promote the knowledge and practical applications of acoustics.